Toronto’s most prominent innovation address; centrally located in the Discovery District. Located in the heart of downtown Toronto, the MaRS Centre is a vibrant, architecturally inspiring space that has become the undisputed hub of Toronto’s Discovery District: every day, more than 2,300 people come to work at the 750,000 sq. ft. complex. The launch of the MaRS Centre Phase 2 will more than double the available square footage of MaRS, creating Canada’s largest science, technology and research centre. Combining avant-garde glass design with innovative new technology, the 20-storey MaRS Centre Phase 2 will be a visual and architectural marvel. MaRS Centre Phase 2 offers state-of-the-art laboratory and office space in a co-location environment, advanced communications and information technology capabilities, access to a large multi-function conference/collaboration centre and collaboration opportunities with other MaRS tenants and partners across Canada and around the world. An aligning atrium will connect Mars Centre Phase 2 with the adjacent MaRS Heritage Building, TTC’s Queen’s Park Subway Station and Toronto General Hospital. 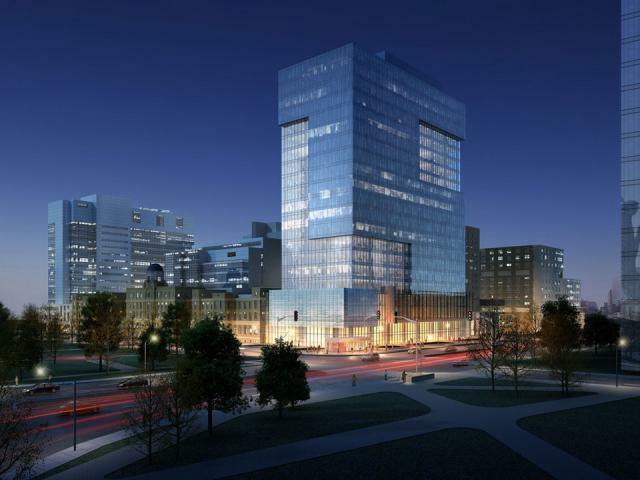 Situated within the Discovery District at the corner of University Ave. and College St., the MaRS Centre Phase 2 will occupy one of Toronto’s most prominent addresses for research and development. MaRS is partnering with the Province of Ontario and continuing its strategic relationship with Alexandria, the world’s leading life science developer and owner, to complete the development of MaRS Centre Phase 2 – directly adjacent to the existing facility (MaRS Centre Phase 1), which opened in the fall of 2005. ● Total building area: 770,000 sq. ft. (rentable). ● 20 stories of lab and office space, generally designed as 60% lab space and 40% office space. ● Connected to the adjacent MaRS Heritage Building and towers through atria and a concourse-level food court. ● Direct connection to TTC (Queen’s Park subway station) and Toronto General Hospital. ● Two-level underground parking garage with dedicated bicycle parking and showers. ● Thermally broken high-performance unitized aluminum and double-glazed curtain wall with laminated glass accent fins. ● Atrium features: 62 ft.-high glazed skylight, metal mesh and terracotta walls and stone flooring. ● One of Toronto’s most prominent addresses for research and development, located in the heart of the Discovery District. ● Building designed to achieve LEED® Silver Certification. Is the MaRS Discovery District Final Phase Restarting?